Ugh. What a horrible game last night. And that's all I'm going to say about that. On to the stamping (which is what you're here for, right? ): today's color challenge on SCS was wild wasabi, blue bayou, and barely banana. I didn't have much motivation, so I kept it pretty simple. I cut 1-1/2" squares, 2 each of bayou and wasabi, then stamped the backgrounds (Looks Like Spring) on them with their respective ink colors. I turned them over and taped them together so it was easier to adhere it to it's banana base. 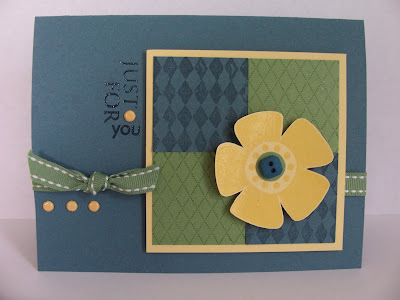 I stamped the flower in versamark on a banana scrap, clear embossed it, added a wasabi 1/2" circle and a button from the rich regals. I popped the flower on dimensionals and put it on the square base. I also used dimensionals to adhere that whole panel to the bayou base, AFTER I placed the wasabi ribbon across the card! Then I tied the knot, stamped the words in versamark, clear embossed, and added the brads. Have a great day, thanks for stopping by! You have this very cute and card to cheer you up though - TFS! Nicely done on the challenge. I like the squares of blue and green with the backgrounds. Love this card! I'm gonna case it for sure. Thanks for the inspiration! This looks great, Becky! Every time you use Big Flowers it makes me want to break it out and use it! Tag, you're it!! Not the same as your last tag...check out my blog, it's a fun one!! Ohhh... I really like everything about this card. The colors, the layout, the big flower! Perfect card! Good job on the challenge Becky- love the little dashes of the yellow mixed in the dark... pretty! This is the CUTEST!! Great way to use an old set like Looks Like Spring and make it look new and fun again!! Love how you did the brad in the greeting too! So cute! Love all those diamonds! A One-Layer Card for Sunday! I've Been Tagged, Take Two!